Another week another episode of Cardcaptor Sakura: Clear Card and in this second episode Clear Card explained something I was curious about. How on earth will it be able make a two cour anime with only nineteen published chapters on a monthly schedule? The answer so far seems to be the same that the original series found expansive filler. Namely the use of filler within the main story the expand its scope and this episode did it quite well, to the point that without actively looking for it you would likely not know it was there. As the episode opens following the opening (which is still great) Sakura and her friends are at school, where Sakura explains what happened to her the previous day. 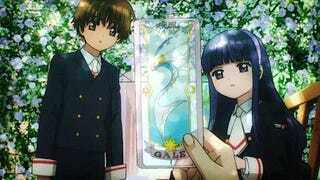 Showing both Sayoran and Tomoyo the Clear Card - Gale. Tomoyo is distraught upon learning of the incident, not because it heralds a new magical conflict, nope because she couldn’t film Sakura’s first capture complete with all the dramatics one would expect. Sakura while mildly charmed by Tomoyo’s antics along with Kero who is overjoyed by them, still worries why this is happening all over again. She then hands the Gale Card to Sayoran and much like Yue before he is unable sense any magical energy from the card or the Key of Dreams. Making it very clear that while similar the Clear Cards are distinct from Clow Reed and the Sakura Cards. As the day goes on we see a bit of the characters school life which while not part of the original manga, does not feel out of place at all. As we spend more time with the side characters we learn little things that make them feel more fleshed out, such as Tomoyo’s artistic processes on how she makes Sakura’s special outfits. We also get a little scene of one of Sakura’s friends handing her a cheesecake recipe. I bring this up as I found it to be a really fun addition on behalf of the anime production team to bridge chapters three and four together. 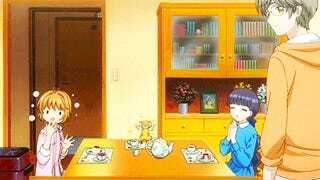 As the beginning of chapter four starts with Tomoyo and Sakura baking a cheese cake from a recipe Chiharu gave her. By adding in the episode the actual event the “Filler” makes perfect sense rather then randomly added detail. 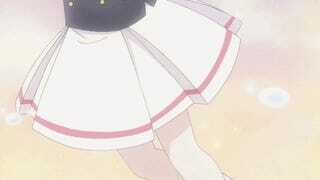 Furthermore, much of their discussion at school makes sense such as Sakura planning on joining the cheer leading squad. An event that is almost certainly going to happen anyways. Therefore leading up to it is a smart world building detail. It shows the writers of the series understands the best way to do filler is expand from the manga, and take ques from it. Moving on from this tangent after a humorous few scenes involving Kero, Toya, and Sakura which is better seen than written and the cheesecake. Sakura and Tomoyo move on to Sakura’s bedroom where Tomoyo has brought Sakura a new cardcaptor outfit. After trying it out, Sakura, Tomoyo, and Kero are transported to another world. A room without exists, formed in a perfect cube. Reminiscent of the barrier spells used by those in the x/1999 universe except white not red. As Sakura and Tomoyo try to escape they realize the room grows bigger as they try to reach the walls. After a little bit of thought Tomoyo realizes they’re actually trapped in a balloon type thing. Pulling out a pin, thanks to her costume making kit transported with her she pops the card. 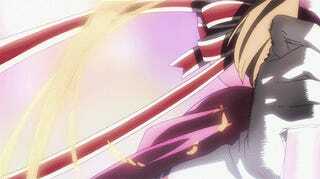 Using the Staff of Dream, Sakura seals the card gaining her second Clear Card - The Siege. A card unlike The Gale that is wholly unrelated to any Sakura Card. As the episode ends we shift focus to England where Eriol is looking at his phone following his call with Sayoran. Spinner informs him that Ruby has finally calmed down and gone to sleep, after insisting on going to Japan right away. Spinner then asks if he will contact “the girl” to which Eriol replies the time is not right. Confirming that Eriol does indeed know more about the Clear Cards then he is letting on. However I personally do not think he is anyway responsible for them quite yet. Following this Sakura has another dream with the mysterious masked figure. However this being only the second episode we of course get nothing from it as the episode comes to a close. All around I found this episode to be quite satisfying, the animation remained top notch and despite effectively adapting only a single chapter of the manga everything felt well paced and not intrusive. If Cardcaptor Sakura: Clear Card can keep up this level of quality going forward I have a feeling it will be very highly regarded. As always, thank you for reading and leave your comments on what you thought regarding the episode. So you all next week!